Christmas is fast approaching, meaning it won’t be long until many of us are pulling out a Terry’s Chocolate Orange from our stockings. 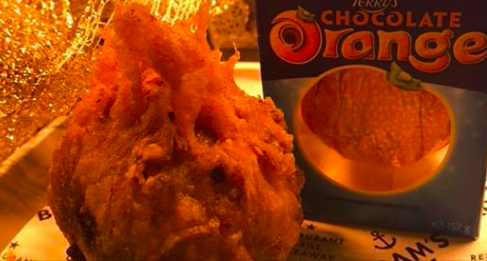 Unable to wait until December, Terry’s Chocolate Orange fans, Adam’s Bay, a fish and chip shop in Gainsborough, Lincolnshire, have created their own twist on the classic sweet treat – a deep-fried one. Honestly, I’m not sure if that sounds like the best or worst thing ever? I’m sensing a deep-fried theme here! When shop workers tried the deep-fried chocolate orange they knew immediately they were onto a winner. We basically put a vote out on our Facebook page to decide what customers wanted battered this Christmas. Items included mince pies, Christmas pudding and yule log but one big suggestion which came through was the Terry’s Chocolate Orange. We tried it and it was sublime so we decided to make it our novelty item for Christmas. It’s definitely more of a sharer. When we tried it, we broke it into segments each and the middle just oozed out all melted. It was very gooey too. Forget sharing, if I’m getting one, it’ll be all for me! While Helen emphasises ‘you can eat it however you like’, you can get one to take away for £4 and add ice cream for an extra £1. In the restaurant the orange and ice cream dessert will cost you £5.50 which isn’t bad for something you may never get a chance to eat again. We have not seen anyone pick it up and bite straight into it yet, but if you want to you can. You could use a knife and fork or whatever makes it easier for you. Since we started selling them we have sold 18 and it’s all gone quite insane really. One morning as soon as we opened, someone had driven all the way from Lincoln and ordered four of the battered chocolate oranges. They’re clearly a fan of Terry’s Chocolate Orange then! While the dessert is certainly one which will divide people, many have been leaving positive reviews on Adam’s Bay’s Facebook page. Had one yesterday nom nom but back to the diet. They are delicious, best yet!! We do get spoilt at Adams Bay! Battered choc orange and mince pies are surprisingly nice!! I wonder what they’ll do next year! To find out more about the deep-fried chocolate orange, you can visit the Adam’s Bay website.